Tinnitus refers to persistent 'ringing' or 'whooshing' noises in one or both ears that is not caused by an external source. It is reported to occur in about 10% of the population. Most commonly it is perceived at night time when there is less interference from background noise. For most people it is not a severe problem and goes away or is managed without treatment. However, it can be disabling for some individuals and cause other problems such as concentration difficulties, depression, stress, insomnia and anxiety. 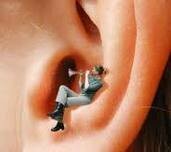 Anyone who has tinnitus would, of course, do just about anything to permanently stop the high pitched whining and buzzing sound they hear inside their ears. Some doctors recommend anti-depression and anti-anxiety drugs to alleviate the condition. This is because anxiety and stress are often associated with tinnitus. Tinnitus can be caused by inner ear damage from exposure to loud noise, head trauma, infection, hypertension, blood flow disturbances, buildup of earwax, allergies or sinus infections, foreign matter in the ear, reaction to medications, and hearing loss due to age. It can also occur due to other disturbances in brain or brain stem function, and spinal subluxations (vertebral mis-alignments). Despite being such a prevalent condition, there are some treatments that work for some people, while others don't. Patients with tinnitus are unfortunately often told when medical management has failed, that there is no treatment available for their problem. This is based on the fact that their treatments for this condition end in limited success, and for many people do not help at all. There has been no complete research yet on how to completely cure tinnitus. The reason why is because this condition in not a disease itself. Tinnitus is a symptom for some other underlying condition or diseases like high blood pressure, and is not a "disease" in and of itself. As a result, the most important and the most excellent way to help treat tinnitus is to determine the cause of the original disease and find ways to treat this disease to eliminate the ringing sound in the ears. However, one treatment that many doctors are now referring their patients for is chiropractic management of tinnitus. Chiropractic treatments are just one example of an alternative effective treatment that may hold promise for at least some tinnitus sufferers. There are so many different causes for tinnitus that not all tinnitus will be solved with the same treatments. What works for one person will not necessarily work for another; much depends on what is causing your tinnitus and sadly there is little research and therapies that can help you to determine this beyond seeing if your tinnitus is caused by hearing loss. For most people, the best approach is one of persistence and trying various therapies until one or more of them work. One of the biggest mistakes most people make is they are so desperate to find a cure for the ringing in their ears, that they hop around from one therapy to another much too quickly making the mistake of thinking that if the therapy does not work in the first week or two, the therapy is not going to help at all. This is where knowledge and patience can really help. Many treatments, with chiropractic tinnitus management among them, can be effective and the benefits reaped if applied or used for a period of time. Clearly from a theoretical basis, chiropractic approaches to tinnitus are worth trying. Chiropractic works on the spine, joints and soft tissues. Chiropractors use a variety of treatments for tinnitus. The most common is performing gentle and mostly painless spinal adjustments (mobilizations) of cervical spinal segments (vertebrae). Clinically, improvements are often observed adjusting the cervical spine, especially upper cervical and cranium, as a starting point. These methods have the potential to restore sympathetic/parasympathetic balance and influencing cortical function. If, as has been suggested by one researcher, there is a parallel between chronic pain and tinnitus; therefore, full spinal adjusting, extremity adjusting and soft tissue techniques also have a role to play. Myofascial release techniques and trigger point techniques (a therapy that uses direct pressure and stretching of connective tissue) concentrating on paraspinal areas, suboccipital and mastoid muscle insertions and the temperomandibular joints would be a good beginning. Exercises and relaxation techniques to help to maintain the tone of tissues could also play a role. Supplementation with ginko biloba may be useful. Spinal adjustments actually help to reverse the subluxations (misaligned vertebrae) in the spine that reduces blood flow and impairs the nerves. Due to the fact that the abnormality of the blood flow and nerve damages are believed to possibly result in tinnitus, chiropractic has been claimed to have great treatment results for some tinnitus sufferers. Chiropractic is certainly not a miracle cure for tinnitus. It only helps alleviate the condition. As mentioned, it will certainly improve the blood flow that may then help eliminate the buzzing sounds. But if the tinnitus is merely a symptom of certain illnesses that one has, then this treatment may not be as effective. The best thing one can do if the tinnitus has an underlying cause of a disease is to medically determine the underlying disease, and then find a way to treat it first. Chiropractic is only one alternative for some people in some cases to improve the communication between the nerves and the brain; and thus helps to alleviate the annoying sound inside the ears. One best suggestion is to maintain a healthy lifestyle; if you don't have one, make some ways to change it. A healthy lifestyle is one big factor to help you prevent and improve your tinnitus. What About Those with Hearing Loss? If you have been told that hearing loss is the cause of your tinnitus and that there is nothing that you can do about it, do not give up searching for solutions. There is some research being conducted now, which indicates that tinnitus may not be so much a symptom of hearing loss for some, as it may make them more sensitive to, and more aware of the tinnitus as they strain to hear and become more aware of the sounds emanating from their ears. Chiropractors have found that the same treatments that help patients without hearing loss often help those with hearing loss. Often times there are many underlying causes for the ringing in your ears and addressing each one of these causes can help you have the best results for dealing with your condition. When it comes to nerves, vitamin B12 plays a special role. The body needs this nutrient to manufacture myelin, the fatty sheath that wraps around nerve fibers, insulating them and allowing them to conduct their electrical impulses normally. A vitamin B12 deficiency can raise blood levels of homocysteine, an amino acid that is thought to be toxic to nerves. Low levels of B12 have been linked to a number of nervous system disorders, including memory loss, decreased reflexes, impaired touch or pain perception--and,< apparently, tinnitus and noise-induced hearing loss. Researchers from the Institute for Noise Hazards Research and Evoked Potentials Laboratory at Chaim-Sheba Medical Center in Ramat Gan and from Tel Aviv University, both in Israel, looked at a group of 385 people with tinnitus and found that 36 to 47 percent suffered from vitamin B12 deficiency. All of the people low in B12 received injections of 1,000 micrograms weekly for four to six months. At the end of that time, their hearing and tinnitus were evaluated. Fifty-four percent reported improvement in their tinnitus, and approximately one-fourth reported reductions in the measured loudness of their tinnitus, according to Joseph Attias, D.Sc., head of the institute and one of the study's main researchers. "Vitamin B12 deficiency is somehow associated with chronic tinnitus," says Dr. Attias. "Long-term exposure to noise may deplete body levels of B12 and so make the ears more vulnerable to noise-induced damage." Most of the people in this study had tinnitus for six years or longer. "It's possible that people who are treated earlier for vitamin B12 deficiency may have more improvement in their tinnitus than occurred in this study," says Dr. Attias. If you have tinnitus, and especially if you also have memory problems, ask your doctor to check your blood level of vitamin B12, he suggests. Although most people get enough vitamin B12 from foods, absorption problems can cause shortages, especially in older people. Strict vegetarians, who eat no meats, dairy products or eggs, are also at risk for deficiency, since B12 comes only from animal foods. If your doctor determines that you have absorption problems, you'll need vitamin B12 shots for the rest of your life. If you don't have absorption problems, experts say that it's safe to take about 1,000 micrograms of B12 a day. It's true that you won't find laboratory animals handling heavy artillery or using chain saws. But you can thank these creatures for another dietary recommendation for protecting ears: magnesium. Magnesium-deficient lab animals exposed to noise have much more damage to the nerve cells in their cochleas than animals fed a diet adequate in magnesium, Dr. Attias says. What happens to these cells when the noise level gets too high? "The tiny hairs on these cells fuse or disappear, and they and their supporting cells eventually disintegrate, along with the nerve fibers going to these cells," explains Dr. Attias. Low levels of magnesium combined with noise exposure eventually deplete the cells' energy stores, leading to exhaustion, damage and death of the inner ear cells, he explains. Human ears, even young, healthy, normal-hearing ones, can benefit from extra magnesium, Dr. Attias says. He found that Israeli soldiers who got an additional 167 milligrams of supplemental magnesium daily had less inner ear damage than soldiers getting placebos (blank look-alike pills). According to Dr. Attias, a more recent study showed that supplemental intake has this same protective effect against long-term noise exposure. If you're faced with a noisy environment, you'll want to make sure that you're getting the Daily Value of magnesium, which is 400 milligrams, Dr. Attias says. Most people fall short in that regard, with men getting about 329 milligrams a day and women averaging 207 milligrams a day. If your tinnitus includes a sensation of fullness in your ear and balance problems, experts 20recommend that you get adequate amounts of calcium and potassium as well. These additional symptoms could be a sign of Menieres disease. Tinnitus is sometimes caused by impaired blood flow to the ears, which can happen in two ways, Dr. Seidman says. First, the tiny artery leading to the inner ear can get clogged with cholesterol, causing a kind of stroke in the ear, Dr. Seidman explains. Second, loud noises can send this artery into spasm, reducing blood supply to the cochlea. In either case, an interrupted blood supply can lead to hearing problems. That's where the antioxidant nutrients--vitamin C, vitamin E, beta-carotene and others--come in. "Antioxidants work by helping to prevent oxygen-caused damage to cell membranes," Dr. Seidman explains. Antioxidants also help keep arteries open and free of plaque buildup, experts say. Dr. Seidman and some other ear doctors suggest that you consider a smorgasbord of antioxidant nutrients: 400 international units of vitamin E daily, 250 milligrams of vitamin C twice daily, 50 to 200 micrograms of the mineral selenium daily and about 50,000 international units of beta-carotene twice daily. Doses of selenium exceeding 100 micrograms daily can be toxic and should be taken only under medical supervision. Some parts of the body have much higher concentrations of certain vitamins and minerals than other parts. That's the case with the inner ear, which, like the retina of the eye, has a high concentration of zinc. That finding has led some doctors to speculate that zinc deficiency may play a role in inner ear problems such as tinnitus. "We don't know much about how zinc works in the inner ear, but it's evident that the cochlea needs zinc to function properly," explains George E. Shambaugh, Jr., M.D., professor emeritus of otolarynology and head and neck surgery at Northwestern University Medical School in Chicago. "Animals fed a diet low in zinc partially lose the ability to hear, and apparently, even the kind of marginal zinc deficiency often seen in older people worsens the hearing loss associated with ear damage from noise or aging." Zinc is involved in a wide array of functions, including helping to maintain healthy cell membranes and protecting cells from oxygen-related damage. Dr. Shambaugh estimates that about 25 percent of the people he sees with severe tinnitus are zinc-deficient. Sometimes they also have poor appetite, hair loss, diminished taste or smell or skin problems. All of these symptoms are related to zinc deficiency. For these people, he recommends supplemental zinc, along with a potent multivitamin/mineral that supplies other nutrients. Although Dr. Shambaugh and other ear, nose and throat specialists may initially give large doses of zinc, up to 150 milligrams a day, it's important to take no more than about 15 milligrams a day without medical supervision. Doctors monitor blood levels of zinc when they prescribe higher amounts. That's because zinc can be toxic in large doses. Zinc also interferes with copper absorption, so if you're taking high doses of zinc, you may need to take supplemental copper (the ratio that's generally recommended is 1 milligram of copper for every 10 milligrams of zinc). Copper, too, can be toxic, so follow your doctor's advice on this. The Daily Value for zinc is 15 milligrams. According to Dr. Shambaugh, few people get 10 to 15 milligrams a day in their diets, while people over age 75 rarely get as much as 7 milligrams a day. Look to meats and shellfish for zinc; cooked oysters, beef, crab and lamb all offer good amounts. Like zinc, vitamin A is found in high concentrations in the cochlea. "All special sensory receptor cells, including the retina of the eye and the hair cells of the inner ear, depend upon vitamin A and zinc to function properly," Dr. Shambaugh says. In one study, low blood levels of vitamin A were associated with decreased ability to hear. And in several studies, from 24 to 74 percent of people with tinnitus reported at least partial relief from vitamin A supplements. "I recommend beta-carotene, which you can take without worrying about toxicity," Dr. Shambaugh says. (The body can use beta-carotene to make vitamin A.) He recommends taking 30 milligrams (about 50,000 international units) of beta-carotene twice a day. Does Chiropractic Work for Everyone? Chiropractic for tinnitus is no miracle cure; it merely resolves one of the possible pathways by which many people's tinnitus may occur. It will certainly improve the blood flow and the communication between the nerves and the brain, but if there are other underlying causes for the ringing in your ears, chances are it will not make it go away completely. In other words, chiropractic care cannot hurt, but may not always help as much as you expect it to. That is not to say you should give up on it, but perhaps you need to look further. Try other remedies in addition to this one, as part of a complete solution to the ringing in your ears. to determine if chiropractic care can help your Tinnitus.